Book Recommendation: "I Am Malala"
This is an inspiring story by a Pakistani education advocate, Malala. She is a remarkable girl who has positively influenced how the world views females. On the day she was shot for attending school, the world was shocked at the determination and aspiration of a young, 15-year-old girl. Though this work is different from other versions of Malala's story, it has offered a more real, determined, and even sassy side of Malala, because it was written by the teen herself. The story begins from the time Malala was a baby. 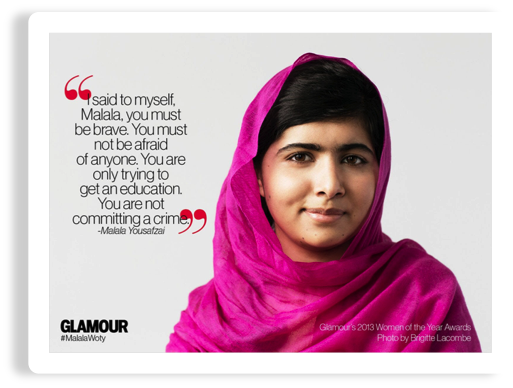 As the Taliban negatively affected Malala's life, little by little, she felt a desire to stand up for girls' education. This was the only opportunity to not be ignorant and helpless. She began to write about her daily life in Swat under a fake pen name in a BBC newspaper while Swat was bombed constantly by the terrorists. She was threatened, teased, warned, and shot due to her campaigns. Despite this terror and negativity, these events never prevented Malala from becoming free of religious stereotypes. This book was told from the point of view of a true survivor and extraordinary female model. Malala was so articulate and humane, that the merciless Taliban felt threatened. It is definitely something significant to think about when we once lived in a society where women were ignored, objectified and abused. Despite the complexity of the topics discussed, the book is quite amusing and enthusiastic as it is told from the perspective of a teenage girl. This is a must-read for teenage girls, like us, who have the ability to explore various treasury thoughts and reflections from someone else our age.